Difference in medieval France was not solely a marker for social exclusion, provoking feelings of disgust and disaffection, but it could also create solidarity and sympathy among groups. Contributors to this volume address inclusion and exclusion from a variety of perspectives, ranging from ethnic and linguistic difference in Charlemagne's court, to lewd sculpture in Béarn, to prostitution and destitution in Paris. 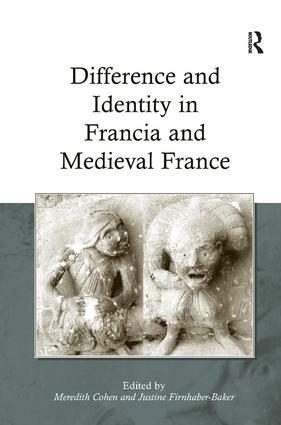 Arranged thematically, the sections progress from the discussion of tolerance and intolerance, through the clearly defined notion of foreignness, to the complex study of stranger identity in the medieval period. As a whole the volume presents a fresh, intriguing perspective on questions of exclusion and belonging in the medieval world. Contents: Introduction, Justine Firnhaber-Baker; Part I Marginalization and Persecution: Exclusion and the yearning to belong: evidence from the history of 13th-century France, William Chester Jordan; One other on another: Petrus Monachus' Revelationes and Islam, Richard Matthew Pollard; Sculpted images from the Eastern gallery of the Saint-Trophime cloister in Arles and the Cathar heresy, Einat Segal. Part II Foreigners and Outsiders: Wanders between two worlds: Irish and Anglo-Saxon scholars at the court of Charlemagne, Linda Dohmen; Temporary otherness and homiletic history in the late Carolingian age: a reading of the Bella Parisiacae urbis of Abbo of Saint-Germain-des-Prés, Nirmal Dass; Ethnic stereotyping in 12th-century Paris, Claire Weeda. Part III Strangers and Neighbors: Outside the city walls: leprosy, exclusion, and social identity in 12th- and 13th-century Rouen, Elma Brenner; The povres avugles of the HÃ´pital des Quinze-Vingts: disability and community in medieval Paris, Mark P. O'Tool; Persecution, marginalization, or tolerance: prostitutes in 13th-century Parisian society, Keiko Nowacka; Scoundrels and scurrilitas at St-Pierre de Sévignac, Peter Scott Brown; Afterword, Barbara A. Hanawalt; Index.